I roast chicken breasts often because they’re a healthy source of protein. However, I find them bland and boring. So I’m always looking for flavourful ways to use the leftovers. One day, I was craving chicken pesto pizza, but didn’t have the time, energy, or the motivation to make pizza dough. So, I threw together a few things that I had on hand and put them on toast. It was so delicious that I started roasting chicken breasts just for this. When I’m really lazy, I use the microwave to melt the cheese so dinner literally takes seconds to make. Toast a slice of bread to your preferred doneness. Spread a thin layer of pesto all over one side of the bread. 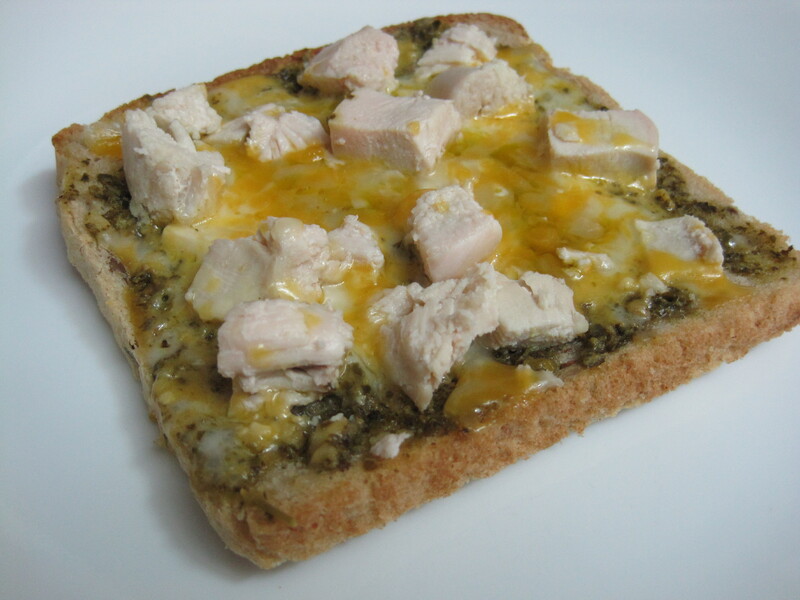 Sprinkle over an even layer of cheese (to taste) and scatter over a few pieces of cooked chicken or turkey. Bake in a toaster oven or a preheated oven at 350 F (or use the microwave) until the cheese is melted and bubbly. Note that if you use a microwave, the bread will soften. Sprinkle over a few pieces of fresh tomato if using and serve immediately. It’s nice to hear from you Tes! Thanks so much for your comment 🙂 Hope you’ve been well! The photos from your travels look amazing!